As they look ahead to the September 23rd release of their new album Real Emotion, Nashville-based alt-rock trio PAPER ROUTE have announced that their headlining U.S. tour will kick off October 27th in Baton Rouge, LA. The national run will feature support from Halfnoise (Zac Farro’s solo project), and include several stops in Texas–Dallas, Houston and Austin–as well as St. Louis, Chicago, Minneapolis, DC, Brooklyn, Philadelphia, Atlanta and Orlando, before coming to a close in the band’s hometown of Nashville. Tickets for all dates can be found here: http://paperrouteonline.com/home/#shows. 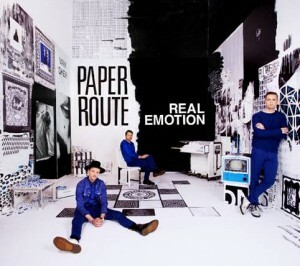 Real Emotion marks Paper Route’s third full-length album and first with Kemosabe Records/Sony Music Ent. The 16-track collection is available now for pre-order at PAPER ROUTE’s webstore and on iTunes for $7.99; the first instant grat track “Balconies” will be released on September 2nd and the album’s first two singles, “Laugh About It” and “Chariots,” are also available now. The current single “Chariots” is currently at Alternative radio nationwide (including SiriusXM’s Alt Nation), was recently added to two of Spotify’s top playlists: Indie Pop! and New Noise, and was chosen as the exclusive track for the FIFA 17 – Official Gameplay Trailer, which premiered at E3 2016 and has over 5.4 million views. Check out the just-released animation lyric video for “Chariots” here: https://youtu.be/K87MK1Fh43Y. With Real Emotion, the band’s creative vision didn’t end with the music. When the time came to select artwork for the album cover, main lyricist and frontman JT Daly, a lifelong artist, found visual inspiration from the themes emerging within the new music. Using mixed materials–prints, paint, and items such as an old TV, cassette boombox radio, playing cards, flowers and a bowl of pill capsules—Daly and his longtime collaborative art partner Micah Bell crafted an immersive room installation, with all surrounding walls and floor draped with several individual pieces, each inspired by a track off Real Emotion. The album cover is a photograph of PAPER ROUTE actually inside the room installation. 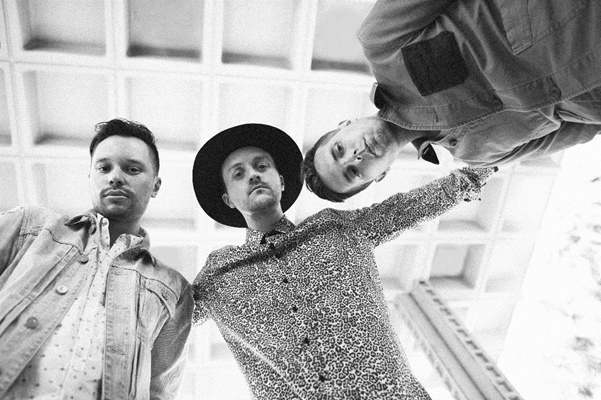 PAPER ROUTE—JT Daly (vocals, keyboards, percussion), Chad Howat (bass, piano, programming), Nick Aranda (guitar)–first conjured up their melody-driven take on electronic-leaning alt-rock back in 2004. Over the next few years, the band split their time between touring with arena-filling acts like Paramore and sharing smaller stages with the likes of Thurston Moore and Mark Kozelek (their fellow performers at SXSW 2008’s Lou Reed tribute show). They released their full-length debut Absence in 2009 and their second LP The Peace Of Wild Things in 2012. 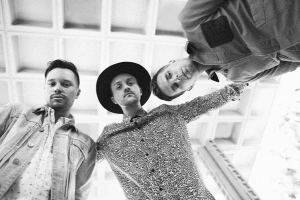 Charged with the raw energy that PAPER ROUTE has revealed in touring the world with bands like Imagine Dragons, Passion Pit and Mutemath, Real Emotion achieves that feeling in part by making guitars central to its intricately crafted arrangements. Thanks for your time! How’s 2016 treating the band so far? How’s your summer been going? What were some of the highlights of 2015 for the band? JT: 2016 has been great. We’ve been able to play some shows and release new music. We spent all of last year finishing our new album and it’s been torture waiting to release it! Nick: We finished an album, we made a music video with a few week’s notice, we toured with our friends Mutemath and we most recently had gear stolen to give you some highlights. We have had experiences, some good and some not so good, but that have given us renewed energy. JT: This summer we’re moving out of our un-air conditioned Nashville studio and learning all of the new songs for our live show. This can be quite the process. Much trial and error. Can you talk about how Paper Route first came together? Why do you think you three work so well together? JT: Chad and I moved to Nashville in a different band and when that group dissolved we naturally gravitated back towards each other to make music. He was making tracks and I started singing on them. We had no other intention besides just making music we would want to listen to. Eventually we shared these songs on the award winning cyber social collective known as Myspace and were kind of shocked to find people really connecting and wanting us to tour. We met Nick when we asked him to tour with us and right before starting this album asked him to be in the band. As far as our working harmony, I think it’s because we’re all great friends outside of the band. If the band ended tomorrow, we’d definitely be bummed, but we’d be bummed…friends. This fall, you will release your third full-length album called “Real Emotion”. How do you think your sound has grown on this record? What has stayed the same about your sound? JT: We had nothing to lose on this album. We were back to how we started, making an album by ourselves, for ourselves. We had things written on all the walls in this house we found outside of Nashville away from everything. Things like ‘Where’s the blood’ / ‘What would you do if no one would ever hear this’ etc. – Our own cheesy motivational posters. But honestly, environment impacts sound/art a lot more than people think. We weren’t afraid, we were the complete opposite, we were picking fights. Sonically, this album is a huge step forward for us with the guitar. Nick stepped it up and you’ll hear it on every track. I’ve read that you put this album together in a cabin deep in the hills of middle Tennessee that you called North House. Why do you think is where you all are your most creative and inspired to write music? What was the inspiration for the songs on “Real Emotion”? Can you talk about how your single, “Chariots” came together? Nick: The inspiration of the songs had a lot to do with wanting to create sounds that gave us feelings of nostalgia from when we got into music as kids, but we also wanted to satisfy the ‘album-centric’ people we have become since we got into music. So we were always looking for a classic sounding song that created a familiar feeling. JT: ‘Chariots’ specifically,..Chad had a track he started and we all loved the chord progression and spirit. After we spent a long time finding the right melody, I went off and spent an even longer time on the lyrics. I wanted the chorus to be powerful visually. Like one of those songs that you sing and you can see the images in your head as you sing it. I sang the word ‘Chariots’ and it was phonetically perfect to me. This is a song about fighting, pleading, proving love. We then took the lyrics and chords to the North House and that’s where everything came together. To me, the song became what it was when Nick tracked his guitar parts. Finally, we changed the groove and the song was finished. It could be said that Real Emotion as an album, is about mental health. Healing, moving on, learning to love intimately and not just from afar. It’s a very honest album. How have your recent California shows been going? Have you enjoyed playing your new songs? Nick: California shows went great, there’s nothing like playing new songs and seeing them work. It was totally electric to play ‘Chariots,’ and to play it at a key moment in the set and it’s an instant highpoint…V Pumped. How have your weekly Facebook Live series been going? Nick: We weren’t sure if it would be awkward at first, but Chad put a lot of effort in to making it like a variety show, and it ended up being really fun. It feels like we are hanging out after a show. We have a lot to share and this is a great way to preview songs and details of our upcoming album. It has us brainstorming every week about what we can do to create a new experience, and we love that. Also, we mostly just laugh a ton. Who are some of your favorite artists? What artists continue to inspire Paper Route? Who would you all love to work with in the future? Nick: Mitski is my new favorite, her stuff is so inspired. Great songs with original sound, and so much emotion. My personal heroes are George Harrison and Elliott Smith. Both magical with melody and super unique guitarists/musicians. JT: I too am in love with Miss Mitski right now as well. Hmmm, but people that have haunted me because I can’t catch up…Tom Waits, I mean you have to say Radiohead, we all love Ryan Adams, and my favorite artist on this planet that spins in space is Nick Cave. For Paper Route we joked when we first started this record that we wanted to make a Brit-Hop album. Brit Rock melody and spirit with Hip-Hop beats and production. Looking back, we did sort of do that. As a member of a sort of rock band. It can be kind of a buzz kill to listen to our genre sometimes. Few artists are really pushing themselves. I think that’s why we are so fascinated with Hip-Hop – that is by far the most forward thinking genre right now. Rules broken in every way. ‘Rock stars.’ Society impacted by what those artists are doing. It takes a lot to make an album that demands attention. I’m not guaranteeing that we did that, but I know we killed ourselves trying.